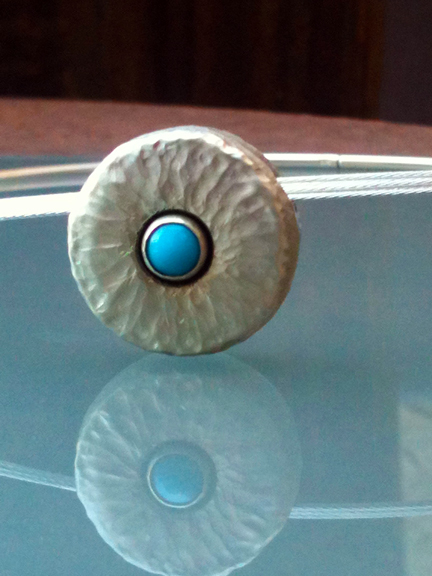 Beautiful blue sky turquoise emerges from earthy hand-hammered silver in this gorgeous piece. Soft play of light flickers on the surface of the silver while the attention is drawn toward the turquoise in the center. May be worn alone as a single pendant or with beads. Modern usage of the classic hollow form shadowbox design. Very contemporary. Entirely hand-crafted. 3/4 inch diameter, 1/4 inch deep. Signed on the back.